Why Does a Woodpecker Peck Wood? The woodpecker pecks, or beats its strong bill, into tree trunks or limbs for several reasons. First, this rapid drumming is used as a mating call. Second, the pecking creates a hole for a nest, with the wood chips it leaves forming a cushion for the woodpecker’s eggs. But most of the woodpecker’s pecking is done in search of food. Once the hole is made, the woodpecker’s long tongue shoots into the hole and spears insects on a barb at the tip of its tongue. A sticky saliva on the tongue also helps trap the food. The woodpecker’s toes flair out, enabling it to climb the trunks of trees and stop and feed at any point. A stiff spine in its tail helps support the woodpecker on the tree trunk. Although it eats mainly insects, berries, nuts, and fruit are also part of the woodpecker’s diet. The woodpecker’s rapid drumming can be heard for half a mile. Why don’t woodpeckers damage their brains when they peck? 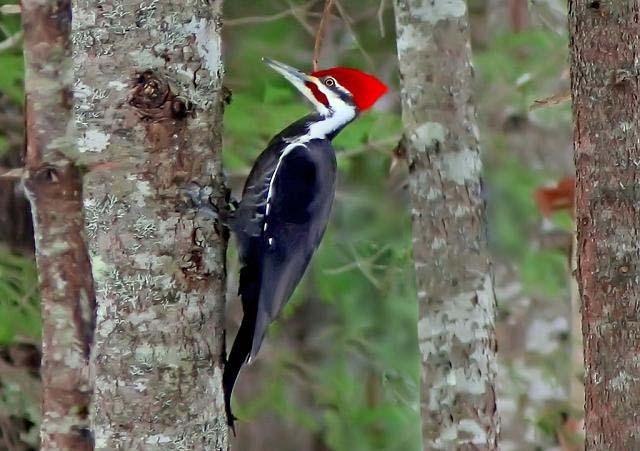 How Do Woodpeckers Know Where To Peck To Find Food and How Does Pecking Trees Help Find Insects? Why Do Moths Like To Eat Wool and How Does Red Cedar Wood Keep Moths Away?